Mike Seibold watches cars drive through a closed road near his house Thursday afternoon in Grand Rapids. Fishermen on the Grand River don't let the water level stop them Thursday. People check out the Grand River near the fish ladder in Grand Rapids. People watch cars drive down a flooded road in Grand Rapids. The women point to the river banks from a lookout point near the fish ladder. 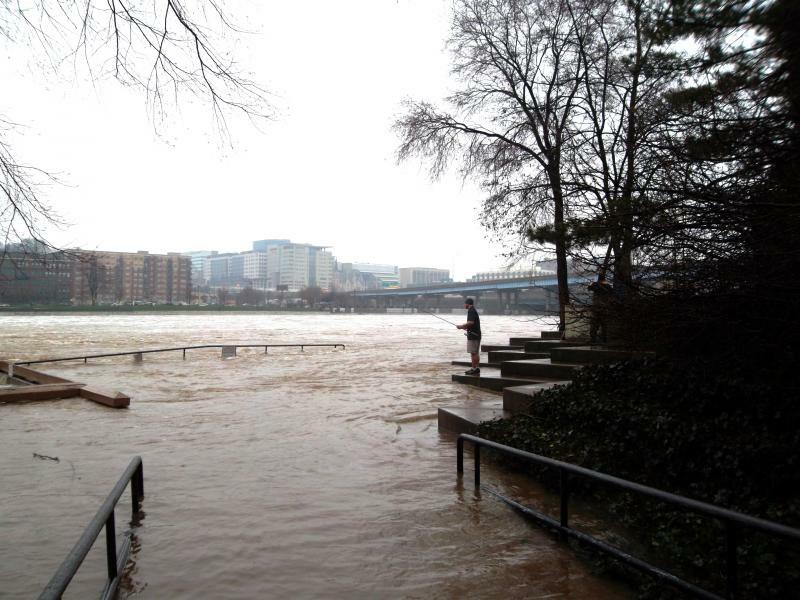 “I mean you can usually stand by that 'no fishing' sign and now it’s practically underwater,” Caverly said. 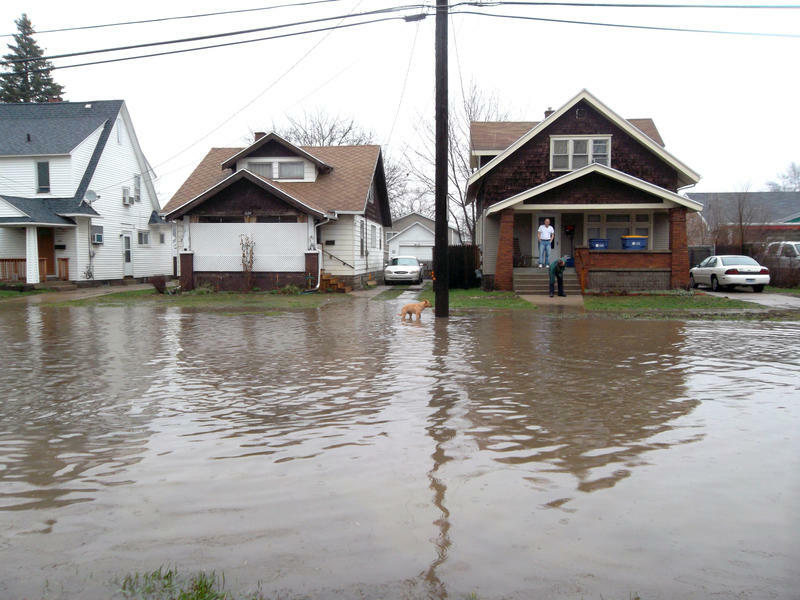 Flooding has forced evacuations in the Grand Rapids suburb of Wyoming. There the mayor has declared a state of emergency. The American Red Cross has opened a number of shelters to help. Several roads are inaccessible. Police have had to rescue some drivers whose cars stalled in the water. The Rapid bus service has had to implement detours. The road near Mike Seibold’s house is covered with water. But he watches people drive past the barricades anyway. He’s lived in Grand Rapids for 42 years, and says he's never seen flooding this bad. “Yeah, this is about the worst,” Seibold said. He watches a Jeep pass by, creating a wake near our feet. “There’s another fool thinking ‘yeah I got a 4-wheel drive,'” he chuckled. Seibold’s got two sump pumps running in his basement. "I bought another one just last week when I had about three inches of water in the basement. One pump couldn’t keep up with it so I got the second one going,” Seibold said. The city is making preparations at its wastewater treatment plant; adding a four-foot wall of sandbags. During a press conference this afternoon, Grand Rapids Mayor George Heartwell said he’s confident the river won’t go over the city’s flood walls, which are designed for a 100-year flood plain. 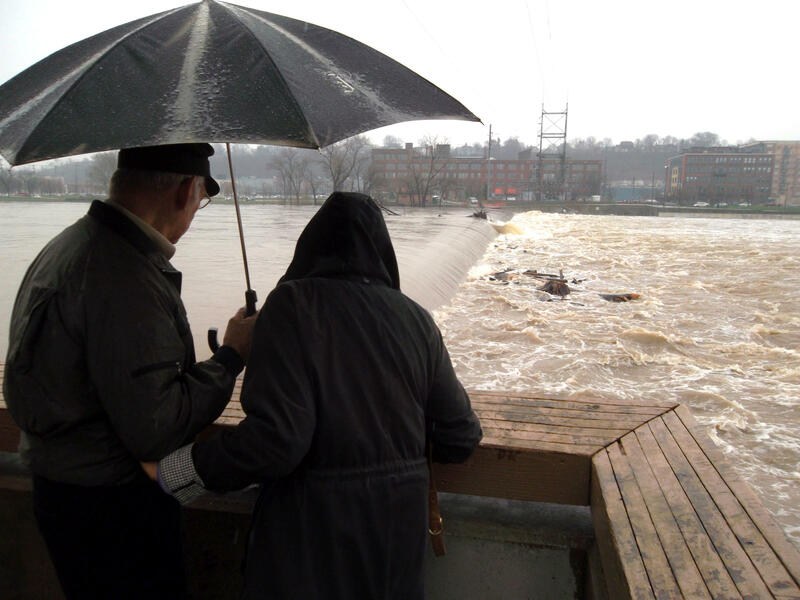 “The real concern is not the water coming over the floodwalls and washing us all away. The real concern is that… storm sewers are just not built to handle the capacity that’s coming out of the clouds right now,” Heartwell said. The Kent County Health Department and the Michigan Department of Environmental Quality have issued a no-contact advisory for the Grand River until further notice. “The (Grand River) drains an enormous part of the southern part of the state. So it’s not just the water that’s falling up in Plainfield Township we’re worried about, it’s all the way over the Jackson where it begins,” Heartwell said. 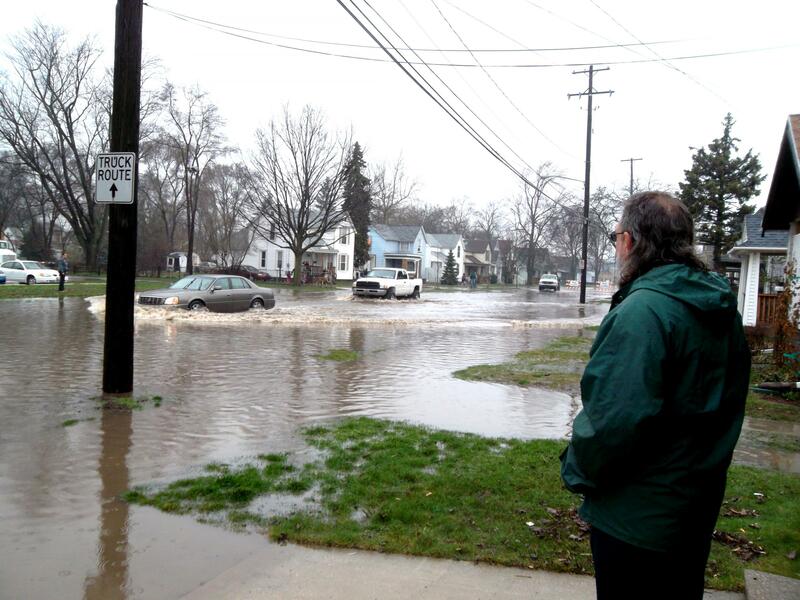 Storms moved across Michigan this afternoon causing major flooding. Tornado watches are over. We updated this post today as we learned more. Scroll down and read up to see how the day unfolded. We reported earlier in this post that the city of Chicago reversed the flow of the Chicago River to relieve flooding in upstream areas. Major flooding in the Chicago Metro region has been identified as a pathway for Asian carp to get into the Great Lakes. Adam Allington explained this concern in a series he did for the Environment Report last year. A spokeswoman for the U.S. Army Corps of Engineers says crews are stationed along the 13-mile physical and electronic barrier along the Des Plaines River, which is experiencing record flooding. Felicia Kirksey no carp have been spotted so far, and that the Corps is confident electronic pulses will continue to deter the invasive fish. More rain is expected in that region tonight, but will taper off tomorrow. She'll have more for us in a separate post. You can check the forecast for the river near you on the NWS Advanced Hydrologic Prediction Service page. Click the dot nearest you and then click the "upstream gauge" or "downstream gauge" links to find the forecast nearest your area.